Squirrels in the attic present a big problem for homeowners. Squirrels can damage the roof, remove insulation and the scent of their droppings can attract even more animals. Naturally, you want to get rid of the squirrels in your attic, but you must first ensure that you really do have squirrels and not bats, rats or other animals. This little guy can do a lot of damage to your home. Gray squirrels sleep during the nighttime and flying squirrels sleep during the day, which means that any noises you hear should occur around dusk or dawn. If you hear sounds during the other parts of the day, consider whether the sounds are coming from something other than squirrels. 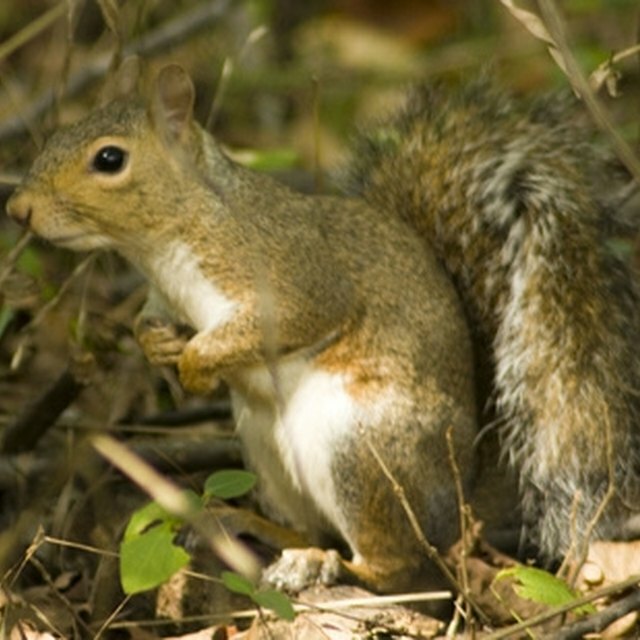 Due to the size of squirrels, the sounds are louder than a simple scratching, which could indicate mice or rats. Search the attic for signs of squirrel droppings. You should see a dark brown or black color, and they are round or slightly oval shaped. The size of the dropping is about half the length of a paper clip. Squirrels need a way to get into your home, so search the home for points of entry. In general, the entry point is a small hole that is close to a tree. You may even see signs of a path from the squirrels running over the same area several times. You may see signs of a squirrel in your yard. Look for wood chippings or pieces of insulation on the ground that are near the point of entry, though it's also possible that the wind blows the wood chips. When you inspect your attic, you may find a squirrel nest in one of the corners. Squirrels typically eat acorns, so you'll find a nest that contains acorns, though they may also find other nuts or seeds.